First, these billboards are about the issues being addressed by United Way of Salt Lake. 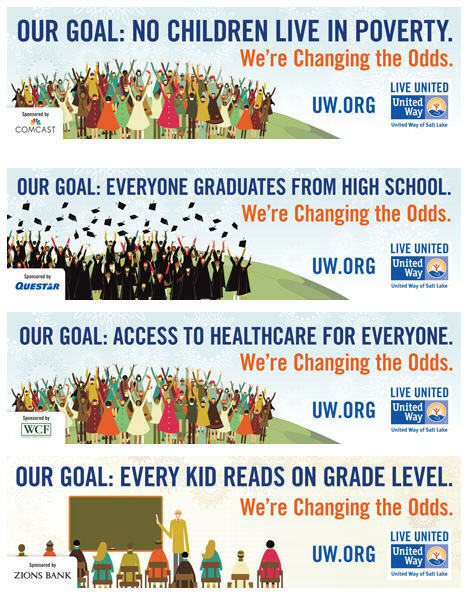 The average person has no idea at all what issues their United Way addresses, and these billboards make it clear that United Way of Salt Lake addresses poverty, high school graduation, access to health care, and reading at grade level. These are issues that people can identify with, rather than generic categories. Our research with donors have found that this is the number one thing donors want and need to know – what issue or issues does their United Way address, and these billboard provide that information. Second, the word “our” is essential to the message. At first I thought the word “our” was referring to only United Way of Salt Lake, as in, the goal was that of United Way of Salt Lake. As I thought about it further, it became clear to me that many people will probably look at the word “our” and think of themselves and the larger community, as in the goal was that of the entire Salt Lake City area including the person reading the billboard. Making the billboard about the reader makes the reader a part of United Way of Salt Lake. Third, fewer words are better on a billboard so that someone passing by at highway speeds can clearly read and understand the entire message. All four of these billboards have 7 word headlines which are short enough to be read and comprehended on a billboard. Even if someone doesn’t have enough time to read the second phrase on the billboard “We’re changing the odds,” they will be able to get the seven word headline without difficulty. Billboards are a great way for United Ways to share their message with the entire community. Crafting an appropriate message for a billboard is the challenge and United Way of Salt Lake has met that challenge successfully with their series of billboards about their issues. If your United Way has the opportunity to use billboards, be sure to consider how United Way of Salt Lake has conveyed a message that will resonate with donors and the community in a way that is appropriate for a billboard. United Way of Salt Lake, you are Doing It Right!